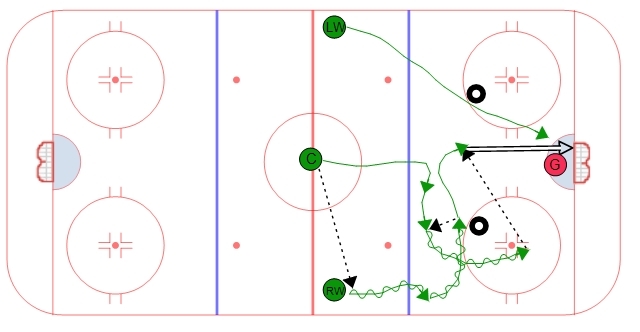 3 on 2 Zone Entry - Overlap #2 | Ice Hockey Systems Inc. Forward Zone Entry aside from Driving wide, dump and chase. Right winger must drive wide to boards then cut across the top of the circles. Player in middle comes over top of the winger in case of turnover to ensure he is on the defensive side of the puck. This is must be a backwards pass not a leave or drop pass. player that makes the pass becomes the high guy. Far player must drive net with stick on the ice for tip in. Ensure he stops 2-3 feet from net for rebound.